Environmental law is a complex subject that relies heavily upon the interplay of federal statutes, federal regulations promulgated by several agencies, and state statutes and regulations. Federal environmental laws include the Clean Air Act and the Resource Conservation and Recovery Act (RCRA). State laws and agencies complicate the picture. This LibGuide focuses on federal and state law and regulation, cases, secondary sources, and government information. 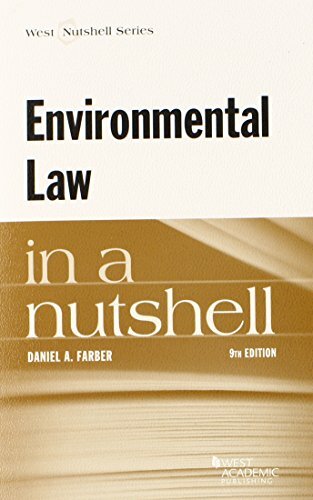 Farber's Environmental Law in a Nutshell provides a foundation for understanding environmental law. Expert text includes coverage of various areas, from acid rain and atomic energy, to waste disposal and wetlands. Touches upon the many statutory and common-law regulations shaping the world in which we live. Examples & Explanations: Environmental Law, now in its Fifth Edition, offers a problem method for learning that encourages students to master a basic understanding of the subject, problem solve, and think creatively about complex environmental issues. Author Steven Ferrey's clear and concise explanations of science, statutes, and regulations bring students up to speed and support an advanced understanding of environmental issues. Environmental Law and Policy is a user-friendly, concise, inexpensive treatment of environmental law. Written to be read rather than used as a reference source, the authors provide a broad conceptual overview of environmental law while also explaining the major statutes and cases. The book is intended for four audiences: students (both graduate and undergraduate) seeking a readable study guide for their environmental law and policy courses; professors who do not use casebooks (relying on their own materials or case studies) but want an integrating text for their courses or want to include conceptual materials on the major legal issues; and practicing lawyers and environmental professionals who want a concise, readable overview of the field.